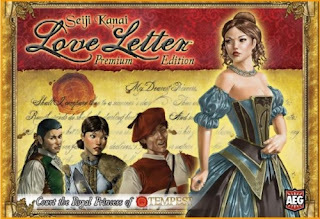 Love Letter is one of the most popular games of recent memory. Just how popular is it? The game has several different brands including Adventure Time, Batman, Santa, and The Hobbit. The game is simple and quick to play, making it a crowd and family favorite. Recently, Alderac Entertainment Group took this popular game and gave it an upgrade in a very decadent way. Ladies and gentleman, I give you Love Letter: Premium Edition. Love Letter: Premium Edition is a game for 2-8 players (up from the previous 2-4), aged 10+. It takes approximately 20 minutes to play and retails for $30. As in all Love Letter games, you are attempting to deliver your love letter into the Princess' hand, while at the same time trying to keep your opponents' letters from making it to her. 1. Shuffle the game cards. In a 2-4 player game, you will use a designated 16. 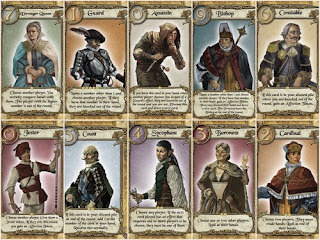 In 5-8 player to game, you will use the full 32 card deck. 3. Shuffle the card to form a face-down draw deck. Remove the top card from the deck and set it aside without anyone seeing it. 4. Deal each player one card to form their hand. Game Play - Love Letter plays over a series of rounds with each round representing one day. On each player's turn, they draw the top card from the deck and add it to their hand. They must then choose one of the two cards, discard it, and apply the effect of that card, even if it hurts them. For example, the King lets you choose another player and trade hands with them. Discarded cards remain in front of the player at all times to help other players keep track of cards played. Play continues in clockwise order with players drawing a card and discarding a card. The round ends when all other players are knocked out or the deck runs out. The remaining players in the round would reveal their hands and the highest card wins the round and an Affection Token. The game ends after one player reaches a certain amount of Affection Tokens (7 tokens in a 2 player game, 5 tokens in a 3 player game, and 4 tokens in a 4+ player game). I was first introduced to Love Letter last year. Amazon had the Santa version on sale for under $2. It seemed like a steal for a game, so I gave it a try. For $2, it was worth the price, but I wasn't a huge fan of the theme or Krampus for that matter. The game play however was solid. When I heard that a premium version was being released, I knew that I had to have this game in my collection. If I could use one word to describe Love Letter: Premium Edition, it would be decadent. For starters, the box is a nice magnetic closing box with a red velvet like finish for a tray. The cards are big tarot-sized and they come with sleeves with the back of the sleeves designed to look like actual envelopes you would deliver to a princess. As for the affection tokens, those too got an upgrade. Goodbye little red cubes. Hello, red heart tokens. If you are any kind of fan of Love Letter, you need the premium version in your collection. If you play with a group of more than four players, you need this game in your collection. Who am I kidding? Everyone needs this game in their collection! This game was provided to me for free by Alderac Entertainment Group in exchange for an honest review.